Platelets are often used in the study the clotting factors in blood-based illness. The clotting factors and properties of platelets therefore have a significant implication in cardiovascular and transfusion medicine. Due to their size (~2 microns) they are difficult to visualize and count. By staining them with calcein AM, multiple Cellometer instruments (X2, K2, Vision 10x, Vision and Auto 2000) can identify, image, and count them. 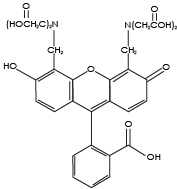 Calcein AM (Calcein acetoxymethyl ester) is a cell permeable, non-fluorescent compound. Upon crossing the cell membrane, calcein AM is rapidly hydrolyzed by cellular esterases inside live cells. The hydrolysis cleaves the AM group, converting the non-fluorescent calcein AM to a strongly green fluorescing calcein. Because the created calcein more hydrophilic it is trapped inside the cells with intact membranes. Cells that do not possess active cytoplasmic esterases are unable to convert calcein AM to calcein, and therefore do not fluoresce green. This allows for a quick and easy detection of metabolically-active cells in a sample. Since calcein AM does not require DNA binding, it stains all metabolically-active cells and can be used to measure metabolic activity in non-nucleated cells, such as platelets 1 2. 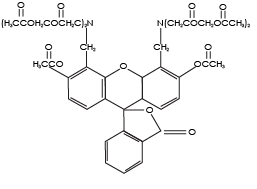 Because calcein AM is photostable, has low cytotoxicity, and does not affect cellular functions, it is a popular stain for the examination of cell vitality and metabolic activity. Pipette 2 µl Calcein AM into 18 µl of dH2O. This is now Calcein AM Solution A. Mix by pipetting up and down at least 15 times. Add 5 µl of Calcein AM Solution A to 45 µl of the diluted platelet sample. The vitality of the cell sample is measured by staining the cells with calcein AM Once the counting is complete, the Cellometer software automatically reports the total number of counted cells that are calcein AM active, and the concentration of cells. Displayed above are the captured bright-field, captured fluorescent, and the counted fluorescent images from a whole blood sample. Only the white blood cells and platelets are stained with calcein AM Since red blood cells are not stained, they do not interfere with counting. In the counted fluorescent image, counted particles are outlined with a green circle. In this case only the platelets are counted whereas the white blood cells, outlined with a yellow circle, are excluded from counting based on their cell size. Gently mix the cell sample by pipetting up and down at least ten times, then load 20 µL into the counting chamber.